Disclaimer: I received a free copy of this game to review from the developer, opinions expressed in this review are my own. Updated 4/2/2018: Epic Dumpster Bear: Dumpster Fire Redux is now available on Steam and PS4. This version of the game is mostly the same, but has some level design tweaks, adds some powerups to levels that didn't have them, removes the Wii U Gamepad gimmick levels, and adds some new levels and cutscenes. It also adds speedrun medals for each level. The Miiverse stamps are still in the game, but only act as an in-game gallery with no real function. 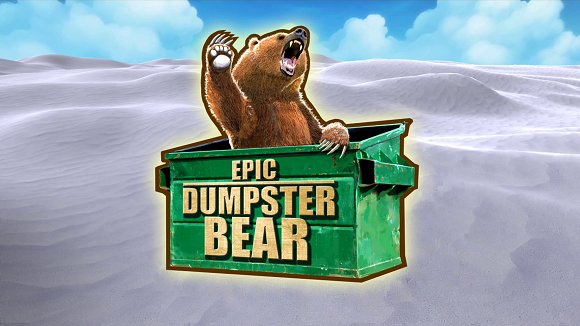 You may have dismissed Epic Dumpster Bear as another low-quality, cash-grabby, Meme Run-esque game after seeing its ridiculous trailer and generic graphics bought from the Unity Asset Store, but, against all odds and expectations, this game is actually a decent platforming experience. 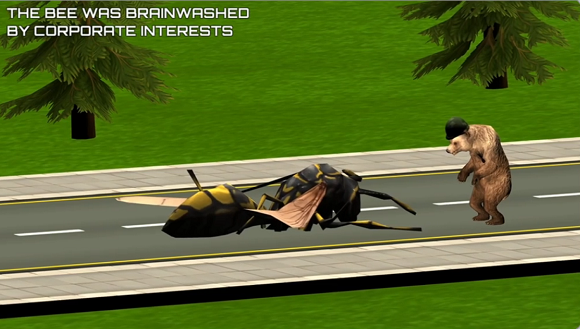 Does Meme Run have attack helicopters that drop cows? I think not! Once again, this is not Meme Run. It's not a randomly generated run-til-you-die game; it's a platformer with actual thoughtfully designed levels. In fact, there are six worlds (with a bonus seventh world of unlockable levels) and each world has about twelve levels each, some of which are hidden behind secret exits or unlocked with in-game coins. Each level also has three hidden red coins which give a bonus salmon (needed for unlocking the World 7 levels) and ends with a belly flop onto a target (high scores here unlock Miiverse stamps). Suffice to say, there's a surprising amount of content here, especially if you're going for 100% completion. I went for 100% (and didn't quite get it) and it took me over five hours just to finish World 6. See also: 4 1/2 hours of gameplay and occasional input from the developer on my Twitch channel. 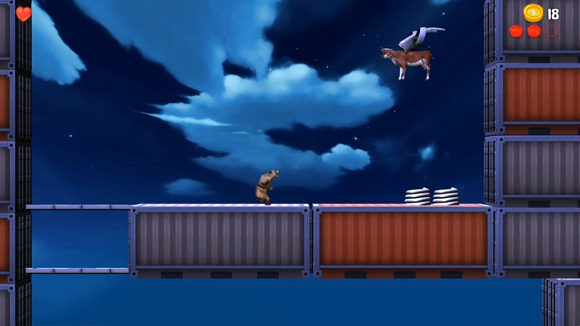 To sum up the gameplay, you run, jump, and wall-jump. It's often very fast paced and laid out in a way that allows you to run quickly through the level without stopping much, if you're good enough. And you aren't good enough. After the first world or two, Epic Dumpster Bear ramps up the difficulty to a level that's just right for experienced players, especially for those who go after the red coins. But fear not - your wee ones can use the collectible normal coins to buy an extra hit point if they find it too hard. Also, it's not all straight running and jumping; a handful of levels are designed around certain power-ups, like a satisfying and over-powered bomb throwing one, a fart-based double jump, and freakin' wings! Beyond that, each of the levels that is unlocked with coins is a puzzle stage which uses the GamePad to influence the level in different ways, but always by strategically pressing four color-coded buttons on the touch screen. Each world's puzzle levels are slightly different, so the ways that the corresponding colored platforms behave in reaction to their button brings new twists to the puzzles. Don't worry though, all of the puzzle levels are optional and you can play every other level using the Wii U Pro controller if you want, so there's nothing stopping you from playing through all of the main game without picking up the GamePad once. This does allow for a neat option with the puzzle levels though: co-op play with one player on the GamePad and one on a Pro controller. It's nice to see a game make use of the GamePad for once, even though these puzzles could've just as easily been done with the mostly unused shoulder buttons. By the way, for the rest of the game, the GamePad just mirrors the TV. 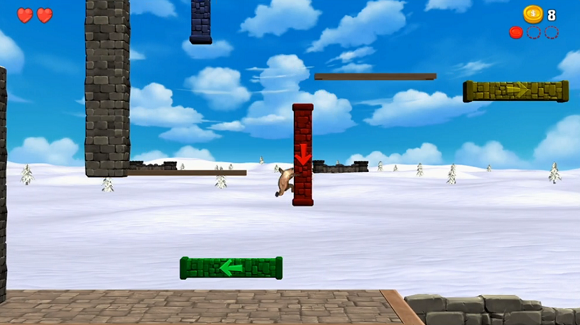 In this puzzle level, activated platforms move in a set direction before disappearing and returning to their starting positions. 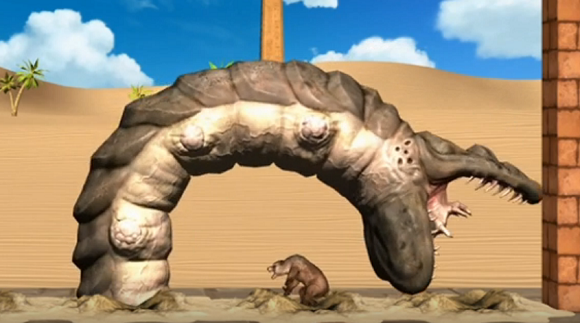 And finally, there are also boss levels at the end of each world. They're pretty underwhelming and uninteresting though. Either you'll kill them in ten seconds, or you'll be delayed by figuring out their hitboxes and then kill them in thirty seconds. While I'm complaining, it seemed to me that there was something slightly off, or at least un-intuitive, about how running and jumping works. It's rarely an issue, and perhaps it's just because I've played a lot of Mario Maker lately, but there were occasions when my jump would go hardly anywhere, even though I expected to have a bit more momentum. It seemed as though there was a small start up between standing jumps and running jumps, and it might have benefited from some sort of middle jump, but it's hard to say just what caused this confusion on my part without experimenting with the programming. But let's get back to the positives. Even though the visuals are laughably cheap, Epic Dumpster Bear surprisingly has an original soundtrack that's actually pretty good! Also, it doesn't take itself seriously (obviously) and has some humor in the form of overly dramatic cutscenes, silly sound effects, and a few other things I won't spoil. Yet it's not a constant barrage of memes and bear puns like you might expect; just an occasional extra silliness so that you'll still be surprised by it when it happens. Epic Dumpster Bear is a bit rough around the edges, mostly visually, but it's a surprisingly enjoyable platformer with a good amount of content and difficulty. It doesn't bring a whole lot that's new to the table, so I fear that it'll get lost in the flood of other indie platformers, but at least I can say that it's more than just a rip-off joke game. It's not fantastic by any means, but it's far better than you'd expect. Want more games that are overlooked because of their graphics? Check out Voidspire Tactics!